The new SIMAC in Svendborg will be Denmark’s largest maritime education institution. With its flexible framework and utilisation of the portside location, it becomes a beacon for modern education and the transformation from a completely industrial area to a new living district with education, business and recreational areas. The new SIMAC will be the focal point of the new port district, which builds upon the existing structures on the site and merges the harbour’s large structures with the diverse city scale of this historic city. 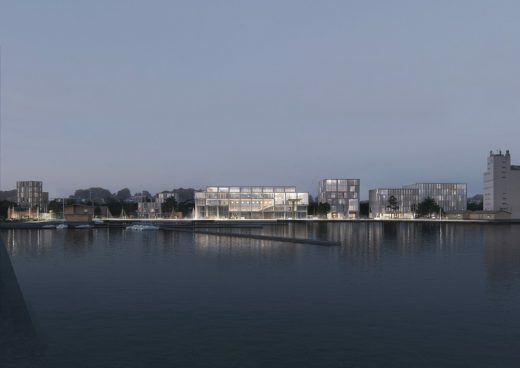 The masterplan is based on the municipality’s “Port of Tomorrow: Development Plan for Svendborg Harbour” and provides for a vibrant and diverse urban quarter with homes and businesses around the reopened stream Kobberbækken. The new plan reflects the same scale as the city centre with its open spaces, squares, promenades and green urban areas. 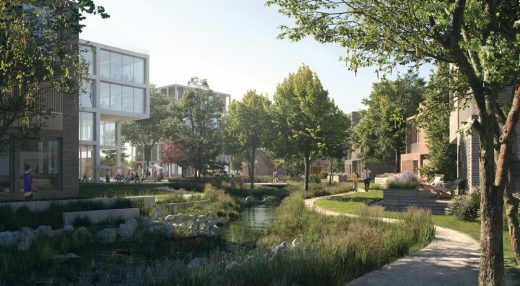 There will be terraced houses and 3-5 storey apartment buildings – all with a close relation to the green squares – along the scenic Kobberbækken. The freeing up of the river brings a number of possibilities, both socially and recreationally, which re-establish one of the city’s most significant natural features. The new SIMAC is integrated into the course of the harbour promenade and the surrounding urban spaces. The building’s floor plan is designed as a cross that forms a corner to four squares and opens up allowing public access to the communal facilities. The quay itself becomes an outdoor laboratory that highlights the school’s work and maritime virtues. In the centre of the building is an atrium that connects the building both visually and logistically across floors. Around the atrium, there are four double-height spaces that mark both the interior and exterior of the façade towards the city and the harbour and contain central functions such as a canteen, auditoria and special workshops. The staircase in the building follows these spaces, culminating on a communal roof terrace with views of the harbour, Svendborg Sund and the city. The ground floor, the tall spaces, the atrium and the roof terrace together form the building’s social infrastructure, which makes it easy to find your way in the building, and becomes a meeting place for the many different activities in the building. The quay, the water and the adjoining urban areas invite a host of activities for both the city’s residents and for students at the new SIMAC, which together with the existing historic buildings constitutes a landmark on the waterfront. Alongside the new SIMAC, a maritime business campus will be opened for entrepreneurs with strong product ideas for the future maritime industry. The business campus has direct access to a vibrant quay area with recreational areas with room for innovative projects and optimal places for interaction between the new SIMAC, business and Svendborg city. The open, flexible and modern learning institution is designed by C.F. Møller Architects and EFFEKT. In 2022, the new buildings will be ready to educate future leaders for The Blue Denmark and a number of other innovative industries. In addition to the new SIMAC, the winning team has also prepared a masterplan for how a new district at the North Quay – with housing and businesses – can take shape. 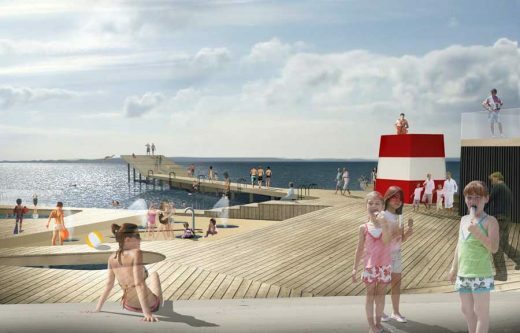 It includes a specific proposal for a reopening of Kobberbækken, which will provide new urban green areas and secure this part of Svendborg against any potential extreme rainfall in the future. The architectural competition was carried out by the SMUC Foundation (Svendborg Maritime Education Centre Foundation), which was founded with the purpose of owning, developing and building the new SIMAC, as well as operating land and buildings in cooperation with SIMAC. Among other things, the project has been made possible thanks to a substantial donation of DKK 100 million from A.P. Møller and his wife Chastine Mc-Kinney Møller’s Foundation for Public Purposes. The proposal from C.F. Møller Architects and EFFEKT was selected as the final winner of stage 2 of the architectural competition. The judging committee describes the winning proposal as a strong starting point for establishing the new educational building and for the municipality’s further work on the development of the North Quay. The jury commends the winning team for their responsiveness and good co-operation skills in the competition phase. This is promising for further cooperation with the SMUC Foundation to realize the new SIMAC. And with Svendborg Municipality regarding the further development of the master plan for the North Quay. 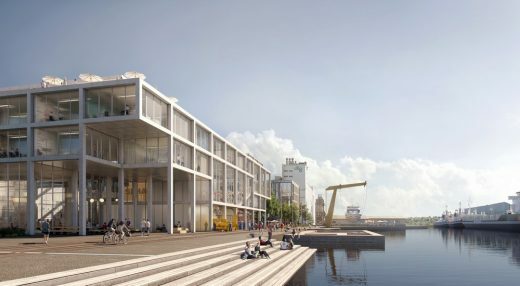 The new SIMAC and the masterplan for North Quay has been designed by C.F. Møller Architects and EFFEKT Architects with C.F. 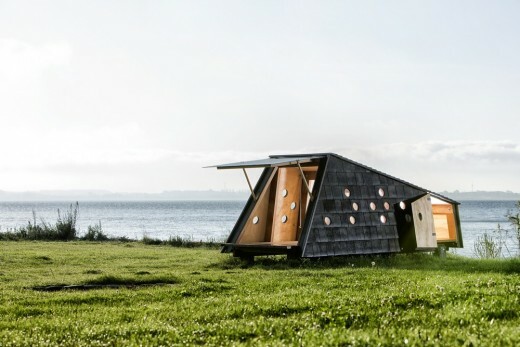 Møller Architects as Lead Consultant. C.F. Møller Architects have great experience with the construction of school and teaching buildings as well as masterplans and urban space projects, among other projects in both Denmark and abroad. EFFEKT has extensive experience in managing complex urban development projects and won the competition for the realisation of the “Harbour of the Future” – Svendborg Municipality’s climate protection and urban development project for the entire Svendborg Harbour. 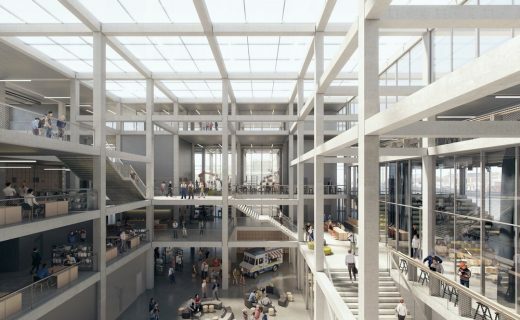 The new SIMAC will have a gross area of 12,500 sqm and contain common areas (such as Campus Square and Open Learning Centre), teaching areas (in different sizes, two auditoriums, laboratories/workshops and simulator centres with virtual learning environments), rooms for administration and technical rooms. •	A detailed plan for a new knowledge and education institution; the new SIMAC at the harbour quay. •	An outline project for a new maritime business park, as the closest neighbour to SIMAC. •	A masterplan for a new district with housing, recreational areas and parking facilities at the North Quay. •	The SMUC Foundation has completed and paid for the architectural competition for the entire North Quay. •	Svendborg Municipality has overall responsibility for all government work and the further work on realising the masterplan for the area. •	The SMUC Foundation is responsible for financing, developing and building the new SIMAC. •	Svendborg Maritime Business Park P/S is responsible for financing, completing and building the maritime business park. May 2018: The architectural competition is launched. February 2019: The winner of the architectural competition is announced. 2019: Project planning, local plans and building permits and contract tenders.